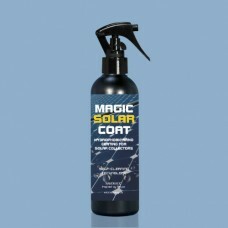 Magic Solar Coat (250 ml) - Nano coating with hydrophobic and self-cleaning properties for photo-voltaic (PV) and solar thermal panels. 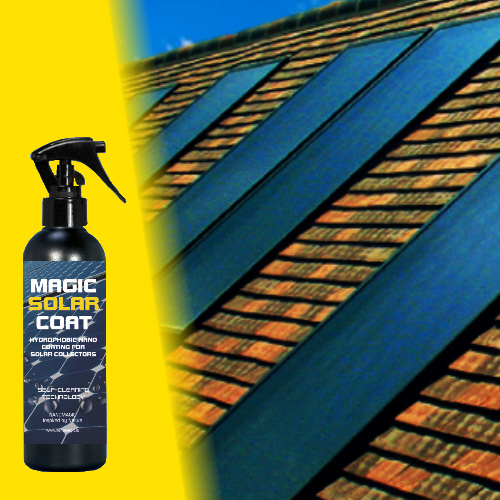 The coating's self-cleaning glass effect stops dust and bird faeces from sticking to PV panels, keeping them clean; maintaining their efficiency, ensuring the maximum amount of electricity is produced. The hydrophobic properties repel water more quickly than uncoated “self-cleaning glass" as found on typical PV panels. This makes cells treated with the Magic Solar Coat more efficient during inclement weather.